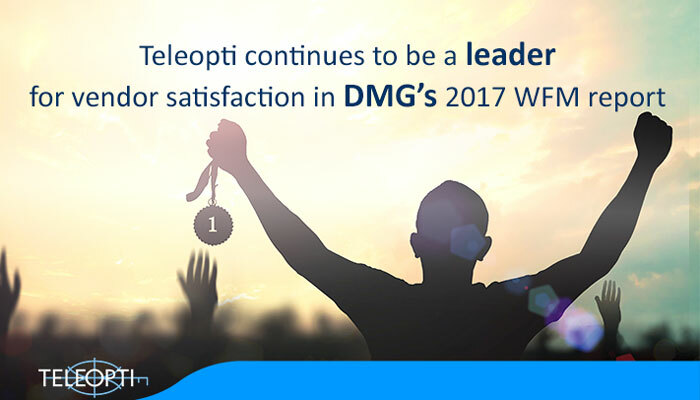 Teleopti, a global provider in workforce management (WFM) solutions, announced today that it has achieved the highest ratings for customer satisfaction in the 2017 WFM Product and Market Report by DMG Consulting LLC. This is the 3rd year in a row that Teleopti has been named a top WFM provider by the analyst firm, consistently receiving high scores from satisfied customers. The report closely examines eight contending vendors, exploring the capabilities of their WFM suites. In addition to DMG’s review of vendors and the WFM landscape for 2017, the analyst firm conducted a detailed vendor satisfaction survey. In this survey, Teleopti received the highest score in eight out of ten evaluation categories, including overall vendor satisfaction. The WFM provider was also awarded top points from customers for ongoing service and support, product innovation, implementation, vendor communication and training. Teleopti’s leading scores in the vendor satisfaction survey is a testament to the company’s efforts toward innovation and collaboration, both in its customer care and the product it offers. In the company’s 25th year of software development, Teleopti continues to expand and enhance its feature-rich, user-friendly solution so as to provide customers with the resources to actively engage both their employees and customers. A commitment to agent empowerment has equally been highlighted in Teleopti gaining the highest score for agent self-service features in the report’s product satisfaction category. Over the last few years, Teleopti has been at the forefront in embracing cloud WFM and the customer’s need to focus more on their service and management strategies, and less on IT maintenance. “Achieving a top position for customer satisfaction, for the third consecutive year, is indicative of Teleopti’s 100% commitment to being a best-of-breed WFM vendor that our customers can trust and rely on,” said David Påhlman, President of Teleopti Inc.
To read more about these findings, you can download Teleopti’s reprint of the report here.